I reply, “Oh, please give me 10 minutes.” A student and I are in my office discussing end-of-term work. Another is leaning against the wall outside my office waiting for a similar interview. Sally, in what seems like only 5 minutes has returned, foregoing formality and blurting out, “Marian, you are wanted in the lunchroom now! I see her audible “now” printed in oversized letters, blinking neon. I know she is serious and wants me to come with her. “Why is she so insistent?” I wonder. I can’t stop trembling. My body overheats, but then grows cold. Shocked out of my wits and still shaking, I finally settle into the delights of a Mad Hatter Tea Party, in honor of my retirement. That scene unfolded nine years ago this past month, back in 2008. If you ask me, I still look a little bit stunned after big surprise . . .
Curtis helping me say goodbye to my office at Florida State College in 2008. He’s 13 years old now. 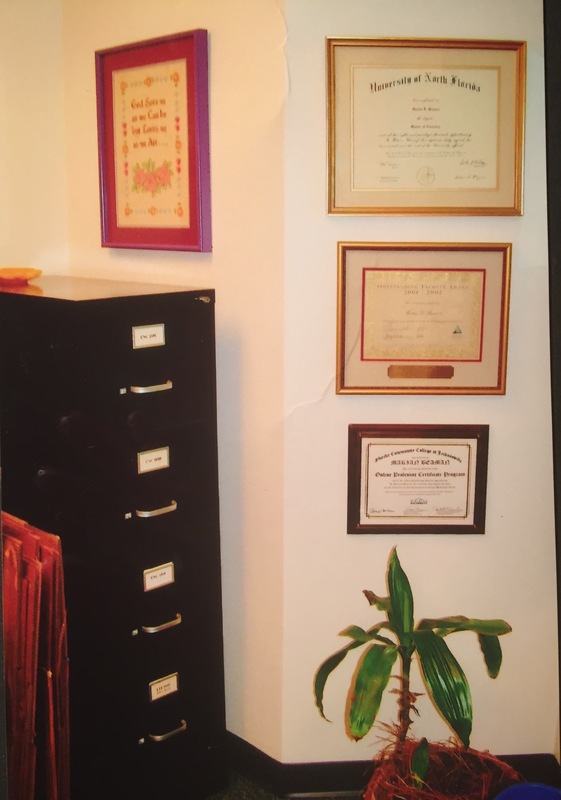 Before my 21-year tenure at Florida State College ended, I was often asked, “What are you going to DO when you retire?” Asking myself the same question, I addressed my quandary by reading Dr. George Vaillant’s book about his landmark study of Aging Well, Surprising Guideposts to a Happier Life. I took notes. I read a stack of other books! I bought a Rosetta Stone course to brush up on French while I figured out what I wanted to do with the rest of my life. My teaching life had been supremely fulfilling; however, in an effort to insert new blood into the department (and pay smaller salaries, I gathered), the College had lured me into an incentive that would phase into retirement over a 5-year period. Now my five years had dwindled to a month at most, and my connection to the college would be severed June 30: Gone would be interaction with students in the classroom, camaraderie with colleagues. Cut off! In an instant! “When you retire, your past and your future meet at a moment of new beginning,” an inscription on another farewell card. But how would I begin? After nearly 45 years in education, I imagined falling off a cliff into nothingness, a thought that to me now seems hilarious, ridiculous – even ludicrous. Take a couple of months off and become a beach bum. 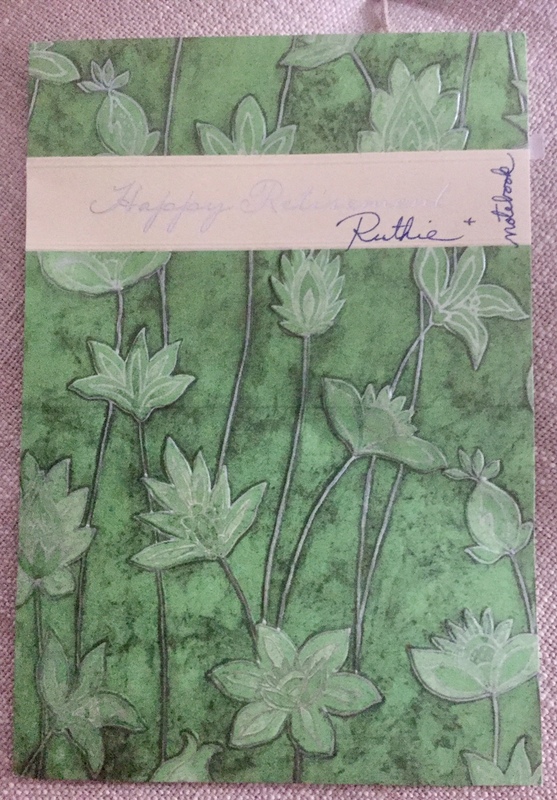 However, dear Aunt Ruthie’s had practical ideas for me. 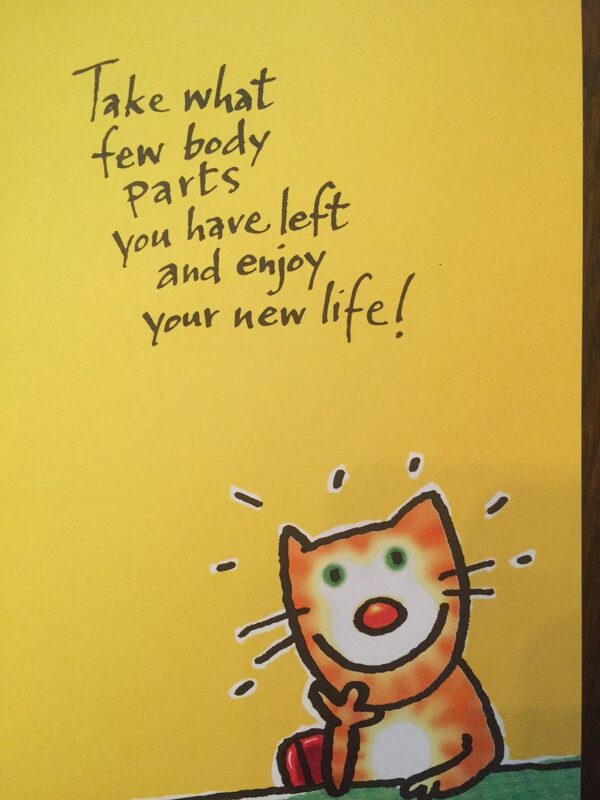 Her retirement card laid out a plan of action. Here it is – salient points underscored, the punctuation intact. 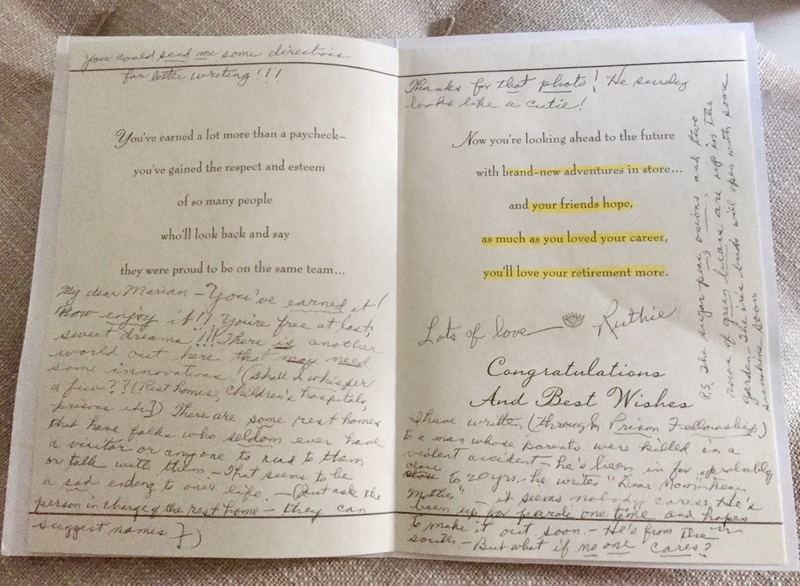 I have written (through Prison Fellowship) to a man whose parents were killed in a violent accident – he’s been in for probably closs close to 20 years – he writes to me “Dear Mom or “Dear Mother” — it seems nobody cares. He’s been up for parole one time and hopes to make it out soon. — He’s from the south. But what if no one cares? Note: We knew about Aunt Ruthie’s care for this man and were aware she corresponded with him. But we had misgivings and unanswered questions. Why was he imprisoned? Did he kill his parents? What would happen when he got out and tried to find her? My aunt and mother, then both in their early nineties required more attention. As time went on I visited more often, planning for their increasing needs for care and valuing our time together. I spent time with grandchildren! Then I discovered blogging and the writing life . . . Since 2013 when I began blogging, my writing life has expanded. I spend hours alone, reflecting – and tapping words on a computer. That’s advice I can live with with! 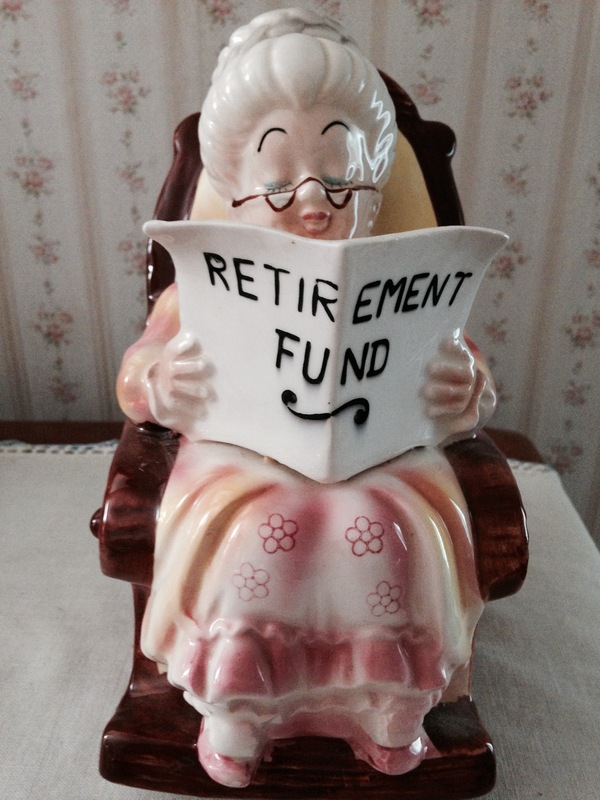 Are you anticipating retirement? In retirement already? In another phase, maybe unnamed? Plan never to retire? Good morning, Marian! So much to ponder here. I think that you are fortunate to have had a career that you love and now a second career in writing, while still enjoying the rich bonds of family and friends. I plan to keep writing until I don’t want to any more, but I told my husband before he retired from teaching that he had to have something in place. He has been enjoying his part-time job at a golf course, and he also gives occasional math lectures/ teachers’ in-services. It is interesting that your Aunt Ruth was so involved with prisoners. My older daughter is also involved with a prisoners’ organization. Thanks for starting the conversation here, Merril. About your declaration to Doug: Your kitty cats serve as muses. I doubt that a husband underfoot would be very amusing – ha! It does sound as though he has fulfillment post retirement with outside interests. Thanks too for mentioning other points of connection in our families. A wonderful read, Marian. Much to ponder. Thank you! Thanks for reading and joining in here, Conrad. Yes, much has changed in our lives since high school graduation and busy careers. Marian, you were so fortunate to have spent your last 21 years at one university. That very longevity fostered long-term friendships, allowed time for goals realized and paved the way for an especially poignant retirement party. You gave me goose-bumps reading about your plans for a cross-stitch project. I have no idea what Aida cloth is or DMC (dental? embroidery?) floss, but I’d love to see your work in progress and most certainly the finished product. I imagine it displayed, framed, among your trivets. Good morning, Marian. I love the photo of your grandson. How important it is for women to share their career journeys with our sons and grandsons. 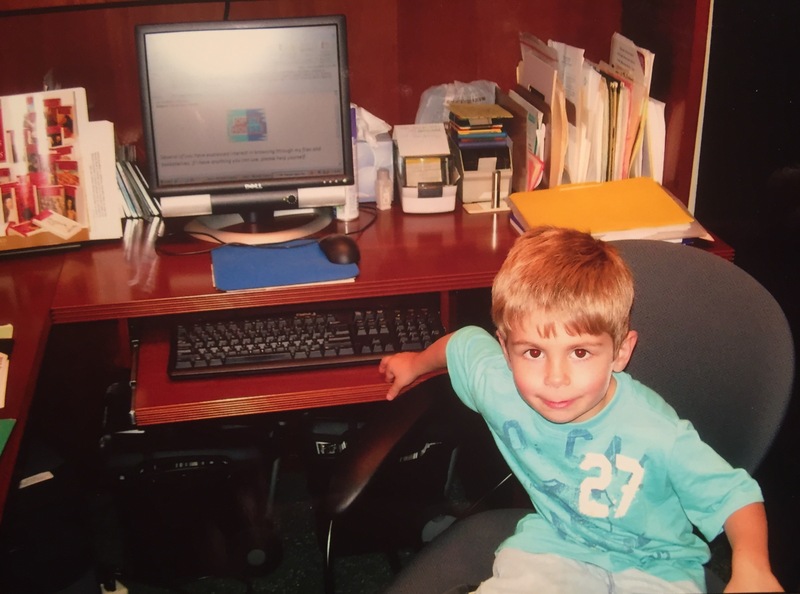 I remember taking my son Daniel on a tour of The Philadelphia Inquirer printing plant when he was a little boy and impressing upon him how important it was for me to have meaningful work. After I left the paper, I ‘reinvented’ myself, so to speak, and wrote two memoirs, one specifically about what to do when a career ends. I have what Aunt Ruthie would call the knowledge that I “earned” the right to pursue my passion, which is writing and assisting women in finding their voice through writing. She spoke words of wisdom when she said there is so much out there that we can be doing to help make the world a better place. Retirement? What’s that? 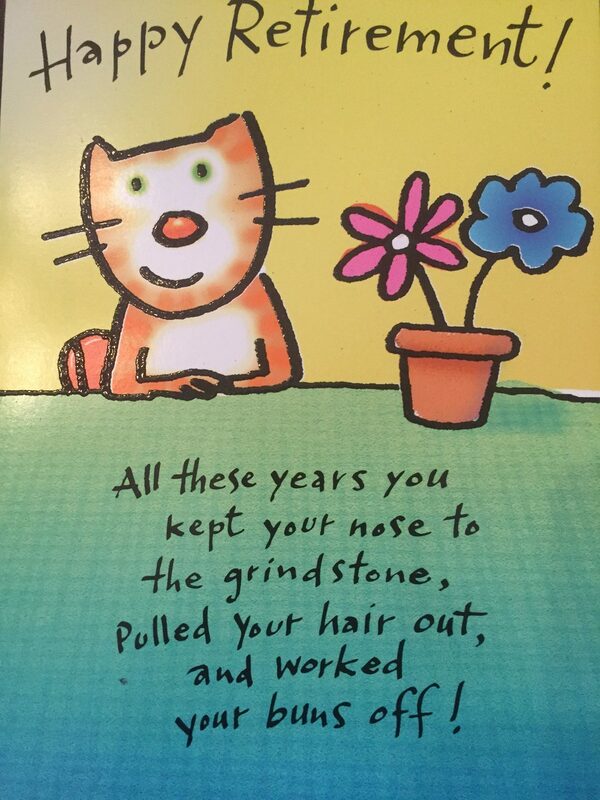 Yes, Susan, we never retire – just graduate to another phase. You’re proof! Marian, Thank you so much for your kind words and support, not just for me, but for our Women’s Writing Circle. Happy to give this a nod. We don’t have quilting circles any more, where I imagine women also could express their feelings and feel heard. I enjoyed the read Marian. I think I turned into one of those who added 5 day to his weekend. Actually I get so many emails daily I think I now work harder than ever before. Like you, I think I work harder now than before when time was more structured. But now it’s by choice – right? Marian — Like the rest of your commenters, I enjoyed reading this post as well. As you know, BEing (as opposed to DOing) is a pretty high on my list of priorities. And while writing is mildly active (a bit of DOing), the outcome is a beautifully painted word picture of our BEing. Write on! My retirement plan is the same exact plan I’ve had firmly in place since I was seven-years old: Joie de Vivre! Leave it to you, Laurie, to observe the melding of being and doing. Possibly two sides of the same coin, if we’re lucky! With aging parents, my life would be a little easier if I were retired, but I don’t see that happening anytime soon. I can’t give up my excellent health insurance and other benefits. Yes, Aunt Ruthie was a kind soul, but so are you to be attentive to aging parents, holding down a full-time job, and writing too. All that takes a lot of energy and I’m sure you have to pace yourself. I admire your pluckness and talent for re-invention, Kathy. You write with the same compassion you must have demonstrated in your nursing career. And certainly, I look forward to the sequel to your first memoir. As a beta reader, I have some inkling of your story line and what it has taken to get it on the page. What a rich life you have had! I like how, after exploring all the options available, you bring us back to the beginning of what it’s all about with Jung’s concept of authenticity. I’m a long way from retirement and wonder whether I will ever retire. I see myself always writing, until I’m incapable physically or mentally of writing. But that won’t be retirement, that will be illness. Meanwhile, although I’m working, I’ve long been working entrepreneurially, not with in a system or organization and very much my own boss. Perhaps that is very like what most people experience as retirement. 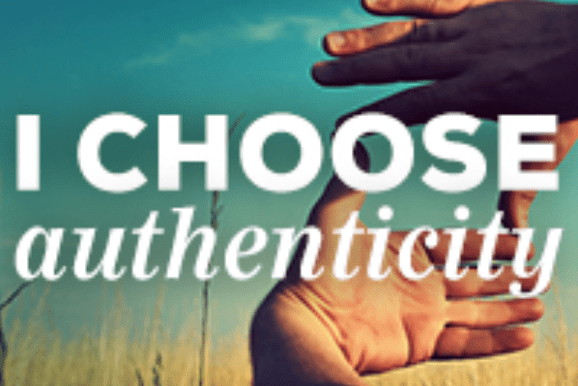 Authenticity has become one of the key words of my existence, along with a number of words that help me focus on the “how” of authenticity: humility, listening, hospitality, empathy, truth and love. I’ve been contemplating the connection between doing and being–I think in many ways, we’re thinking about the same subjects! In writing, I have recently come to see that my writing voice, too, as well as my subjects/topics/themes, ought to be authentic. Because why else write, if not to express ourselves? Thank you, Tracy, for enlarging on the meaning of retirement and of leading an authentic life. In addition to writing, I think you are running a restaurant too. Right? Maybe just cooking up a storm . . . ! Yes, we do seem to be on the same wave-length these days. Staying curious – and in touch with ourselves and others, as you show here – is key. Marian, you “retired” the same year I did! I was in my 50s when I earned my degrees in English & German lit. after returning from Africa, but I was able to teach at several universities while studyIng, and I also tutored privately and at Rockway Mennonite school. That all changed when we moved in 2008. Settling into a new home, finding new friends and a new church (we moved across provinces to be nearer to kids and grandkids) took a lot of time and energy. My husband and I took several tours and I began blogging in 2012, and now I’m working on a memoir after taking several creative writing courses. Hardy (my husband) is dealing with some health issues and I’m his emotional support. I also enjoy working in our small yard, baking, and of course relating to our kids and grandkids (8 of them!) I enjoy worship leading at church. I thank God every day for my good health and ask for patience and acceptance when this will not be the case. I love my retirement! You have had an amazing life, Elfrieda, and so far enough energy to enjoy it. Energy, that’s the thing! We are not that far apart in age, and sometimes I need a nap to make it through the day. Yet both of us will get our memoirs written. YES! One thing that stands out as you reflect on your work life: Family and faith stands at the heart of all your do. Thank you! Thank you for choosing the challenge of “being” and sharing it with us. I love all the photos and, especially, the message from Aunt Ruthie. I’m not retired, but, as one who is self-employed, I get to work with a lot of open space in my schedule. I am grateful for a kind of relationship with time that allows for reflection and silence. I see a Queen of Being hat on your head, Dolores. I love that you have “a lot of open space in [your] schedule” and best of all – “a kind of relationship with time that allows for reflection and silence.” I could not have said it better. Your comments are always centering and wise. Thank you! I love the Carl Jung quote and think of it often. Such privilege. You didn’t retire at all–and neither did I. 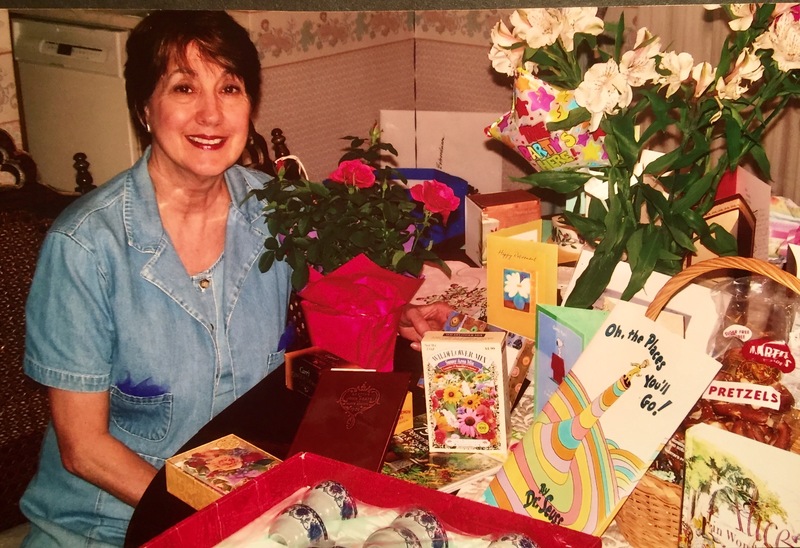 When Vic died, I had already taken a year off from teaching women’s health to care for him. I imagined I would go back. After his death, one year passed, then another. I finally stopped renewing my license. I was already writing (I’ve always written) to digest trauma, grief, and a shattered sense of self. I didn’t know I was writing a book or would write blogs. I didn’t know I would keep writing in new areas and explore new things. Now I see so clearly how the end of the old life was the beginning of the new–and it’s startling even when it’s not a surprise. Jung loves to talk about the way the soul cycles through life, returning to beginnings and letting the old die. You were fortunate enough to begin a new cycle. Thank you for sharing your good fortune with the world. And thank you for expressing the quirks of the cycles in life in a fresh way, Elaine. I especially like your observation that “it’s startling even when it’s not a surprise.” I want to think about that with regard to our long goodbye with Ruthie and then the sale. Trent Gilliss’ quote from On Being has been sitting on my desk since June and here it is: “What’s given must not be possessed. It must be passed on.” I suppose that’s as true for opportunities in life as it is for possessions. Another lovely post, Marian. Thank you. It was a delight to learn a bit more about you. I didn’t know that back when you became my first stalwart blog Commenter, you were starting a new chapter in your life. I was too, in a way, with my blog. First, a marketing tool for my memoir, it’s now become a very important part of my life in and of itself. A mission, if you will, as our world gets smaller and (seemingly) less tolerant. I’ve long disdained the idea of retirement. I refuse to check that box when asked. For me retirement connotes being put out to pasture: fine if you’re a four legged stud, but not so appealing for me as a human. I prefer the idea that life is (hopefully) one long journey, a book if you will with many chapters. I just keep on turning the pages to discover what’s next. As long as I continue to find meaning in the page I’m currently on, I’m good. Ah, Janet, your images are spot on: the four-legged stud out to pasture (so funny) — and the idea of life as a book with many chapters. That I can handle. I am sure you were missed at your former workplace. It was hard for me to leave as well. I wanted to travel, live in a warm place and write to my hearts content when I retired almost 3 years ago. I found it hard at first as I had worked for 48 years and I was so used to the routine of work. I was also blessed with jobs I loved. But this is a new stage in my life and I am loving it too. As long as I am still learning and growing, I am OK.
You are among my many online friends who resist stagnation. As one of my former colleagues told me once, “I’d rather be green and growing than too ripe and rotting.” That’s certainly has applied in your case. For all of us, I suppose, there are challenges. I remember your mentioning difficulty with selling your Canadian house when you moved to Spain. Still, you ended up enjoying another phase of your dream. Thanks, Darlene! Thanks for letting me know. The connection must have been broken because I’ve always replied. Thank God we don’t have to strain to give & take here. any more. You show by example how it’s done, Susan. I like the idea of ReFire, suggestive of the energy needed to fuel our passion. Thanks for giving it a new name! 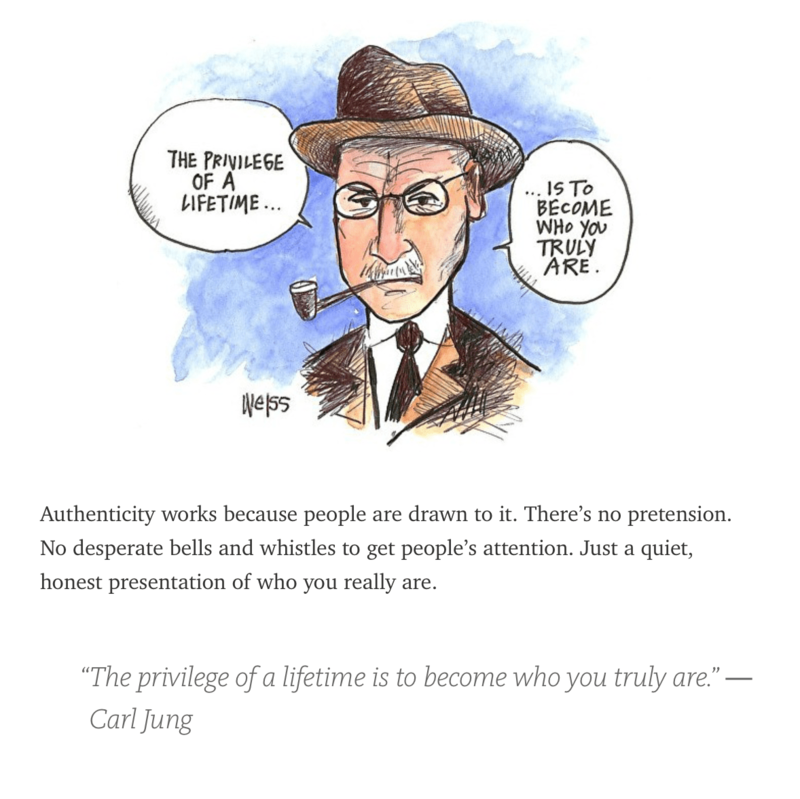 Wonderful post, Marian, and I love the quote – the privilege of a lifetime is to become who you truly are. Retirement is a strange word, isn’t it? It suggests an ending – time to be put to pasture or stored in the garage like a broken vacuum cleaner while the newest model (or younger cow) takes over. Ha ha Retirement should be viewed as a blossoming! All the work paying off with the freedom to become whatever we wish to be – to take chances, pursue dreams, go on adventures, be creative, learn new things, grow. I’m just a couple years away and can’t wait!! Thanks for taking the time to read and comment on my website where you’ll find tokens of my Mennonite life or snapshots of what’s going on in my life right now. So appreciated, my friend! I like your description of your surprise retirement party. I’ve been toying with dates for my own leave taking from my long tenure here at Mennonite Broadcasts–which eventually evolved to MennoMedia/Herald Press. Future plans: more writing for sure, more visiting and caretaking of grandchildren (I hope), more visiting Mom, more travel anywhere! If it weren’t for the grandchildren, I think I would be more into working awhile yet; but I think I’m getting to the place where I realize–so much–but that I’m not going into here! One realization is that maybe it is time to give others a chance at a position like mine. Time to let it go, move on. I admire your longevity and amazing output at MennoMedia. Obviously I can relate to the push-pull feeling: Should I stay? Go? If so, when? As you may already know, we have just taken early retirement following Peter’s illness and are about to embark on a year-long trip through Europe and, hopefully, see a bit of Morocco as well in the New Year. We are travellers at heart, both Peter and I, so we are becoming who we truly are. Wise words indeed and couldn’t have come at a better time. Thank you again for sharing, Marian. I’ve noticed this lifestyle change both on your blog and on Facebook pages. I’m glad you both agree to the traveling, a wise choice at this stage of your lives. Safe travels on this unique earth-walk. I’m sure you are recording this in journals and online. Blessings, Fatima! Sorry I didn’t reply to this earlier. What has happened is that in retirement, I seem to be busier than ever but also have time to do the things I was longing to do when I was writing my book. I’m loving the freedom to choose what I want to do any particular day and letting things I thought were absolutely necessary slide! You are in an enviable position, Joan: a woman of accomplishment who sets her own timetable. I’m reading one of May Sarton’s journals now and even at age 82 she was bewailing the fact that she had letters to write and manuscripts to edit and had very little energy to rise to the task. (Do I hear you groan?) The price of such fame seems a little too high.